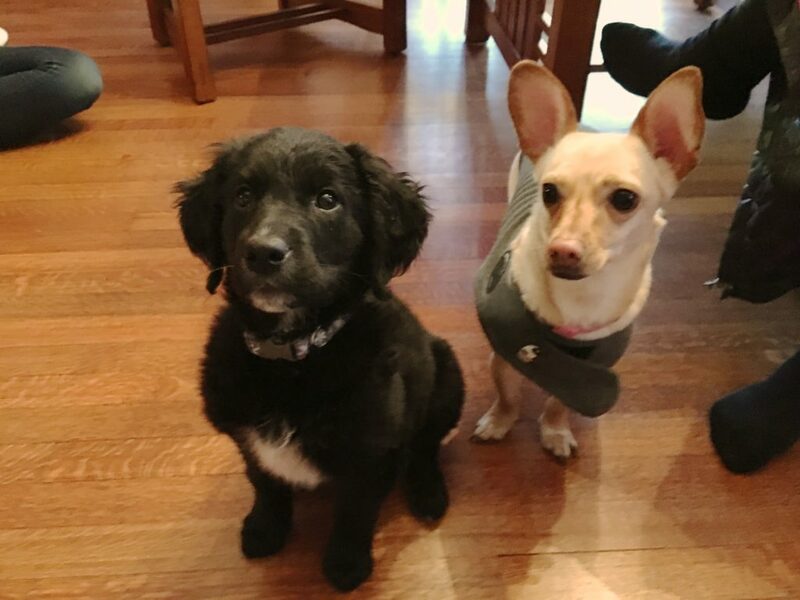 Harley (left) is a nine-week-old German Shorthair Pointer / Golden Retriever puppy who was adopted into an Omaha home with existing dog Fifi, a three-yearold Chihuahua who barks a lot and was not very socialized. The guardians set up this puppy training session to help Harley stop a few unwanted behaviors; chewing and nipping, having accidents and basic puppy obedience training. The family’s father arrived at the family’s home about the same time I did so he escorted me inside. Shortly after entering, I spotted a few interactions from the human that was sending Fifi a mixed message. While its natural for most humans to try to pet a dog to calm it, anything a dog is doing when you pet it is why the dog thinks its being petted. Also, the higher a dog is, the more rank or status it has. So both of these interactions should be avoided if we have a dog who is barking or displaying any other unwanted behavior. I sat down with the family’s father to discuss the things they wanted to accomplish in this session. The number one priority was potty training so I spent a few minutes going over puppy potty training basics to speed up the process and stop accidents in the house. In the course of the session, we took Harley out to potty 3-4 times and each time, she went twice. Not every puppy goes potty this way, but recognizing it is very helpful when that is the case. I recommended that the family wait until she has gone potty twice each time before they bring her back inside. I made a number of other suggestions based on the puppy training secrets I discovered while training my own puppy Quest this last summer and fall. I get so many questions about raising a puppy, that I shot close to 200 puppy raising tutorial videos covering a wide array of topics like stopping a puppy from chewing, using carrots to stop chewing, potty training secrets, feeding tips to increase your puppy’s intelligence and problem solving skills, making sure the puppy likes riding in the car and how to help an adult dog accept the puppy. You can find those videos and many other free puppy training videos stuffed full of puppy raising tips and secrets on the Quest-Ed section of this website. But right now, Harley is in what is know as the Critical Socialization Period and how his family exposes him to situations, animals, people and experiences over the next 2-4 weeks will determine how balanced and confident a dog he will grow up to be. The Critical Socialization Period is the most important developmental period your puppy will have and you only get one crack at it. I created a list of 330+ Critical Socialization Period experiences and have it linked in a post I did on Quest Ed that covers this often overlooked but CRUCIALLY important period in your pup’s life. I suggested as strongly as I could that the family help Harley by exposing her to as many of the experiences on the Critical Socialization checklist as they can for the next 2-4 weeks. The time they invest now will have a direct correlation to the dog that Harley grows up to be. Now many people confuse puppy socialization with puppy training so I created a page in the Quest-Ed section of my website to address the differences. One other puppy raising tip I discovered while raising Quest was how many common problems can be solved or eliminated by setting up a puppy play pen. Of course, I created a page in Quest Ed that explains the benefits and how to set one up. I suggested the guardians set up a puppy playpen like this to help contain potty training accidents, avoid Harley developing a habit of chewing furniture, clothes, etc and kennel training the puppy without spending any time doing so. This kind of passive puppy training is both easy and effective. Itemize the Critical Socialization checklist linked above and get as many of the items accomplished as possible before the puppy turns 12-14 weeks. Do not expose the puppy to anything that may scare it unless its a controlled situation with lower intensity until he fear period ends at week 12-14. Incorporate a rule that the children can’t go over and pick up and hug the puppy when its sleeping. Wait for the puppy to wake up to pet or love it. If possible disagree with the puppy before it breaks a rule or gets into trouble. Whenever possible distract the puppy from undesired actions and behaviors through redirection. Drop a couple of baby carrots behind the dog then call her attention to them so she is no longer facing whatever she was doing. Have the family children invite friends over as often as possible to help socialize the puppy for the next month. Do not pet the puppy when it jumps up or does any undesired action as this will train the puppy to continue to do that action. Come up with a list of commands and only use that exact command word instead of variants to help Harley learn faster. Follow the puppy potty training instructions as detailed in the video. Set up a puppy play pen in the dining room. Family members should hang out in the puppy play pen with Harley the first several times she goes inside. After a day or two of hanging out inside with the puppy, practice sitting in the room with the play pen (outside of it) while Harley and Fifi are both in the pen. Do not let them out until they are calm and relaxed (Never let them out when barking, crying or whining unless its to communicate they need to potty). Get a bunch of appropriate play toys for Harley as detailed in the Quest Ed link above. Get edible chew items (avoid using rawhides) and give the puppy one each time its hanging out in the play pen with a human or Fifi (Every time for first the first few days to a week, then often but not every time after that point). Practice the sit exercise a few times a day as shown in the above video (1-3 minute practice sessions). Practice the “crash” exercise a few times a day as shown in the above video (1-3 minute practice sessions). Try to vary it up so the puppy doesn’t automatically move into a down after getting a sit command. Use passive training to reward Harley anytime she engages in an desired action or behavior. Make sure Harley is only eating puppy food and not Fifi’s adult food. Get some goat’s milk and give Harley an ounce of it each morning. If Harley is nipping or mouthing, consider if its been a while since he had a nap and give him one if its been a while. Yelp loudly and stop interacting with the puppy any time his teeth touch a human’s skin. If puppy continues to nip and mouth, get up and leave the room. Order ridges nylabones, antlers and other hard chew toys and have each human carry them around to tease then let Harley take it from the human when he gets mouthy. Sign Harley up for a Puppy Socialization class to help her develop confidence and social skills.